Many people who enter the United States do so on a temporary basis with a visa and must depart after a short trip. Permanent Resident (Green Card) status allows you to live and work in the United States permanently. You can purchase property, obtain government loans, start a business, enroll in school, and be employed by virtually any employer in the United States. The physical card is green, hence the term green card. Permanent resident status is also one step closer to becoming a United States citizen. Also legal right to apply for government-sponsored loans, including education, as well as loans for houses, cars, and businesses. You may also qualify for in-state tuition, which is typically not an option for most foreigners. 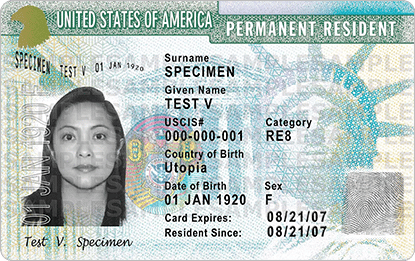 There are several differences between a permanent resident card and a visa. Many people who enter the United States enter with a visa, or as a citizen of a visa-waiver country. A visa is a temporary document. With a visa, you request admission at the port of entry. A visa does not automatically grant you admission into the United States, as many people mistakenly believe. Even if you have a visa, you can be denied admission when you present yourself at a port of entry and have your visa revoked. A visa is also for a temporary duration and has an expiration date. The visa will also carry specific conditions and limitations, not present if you have lawful permanent resident status. Permanent resident status allows one to live and work permanently in the United States. However, this is a status which must be renewed every ten years, and that can be taken away. For example, staying out of the country for more than six months or even committing a crime could subject you to losing this type of status and being deported. United States Citizenship is a permanent status. United States Citizenship cannot be taken away. It requires you to take an oath to support and defend the Constitution and Laws of the United States of America. United States citizenship has many benefits such as the right to vote, and serve on a jury, the ability to sponsor family members for their own permanent resident status (green cards), and being able to obtain federal grants and scholarships. To learn more about United States Citizenship please visit our website for our video series. To summarize, if you wish to live and work permanently in the United States, you must seek to obtain permanent resident status. Permanent resident status can take years or even decades. Applications for permanent resident status can involve many government agencies including the United States Citizenship and Immigration Services, the National Visa Center, and consulates embassies abroad. Untimely document responses result in denied applications. Additionally, denied applications waste time and money. At Shupe Dhawan, you can take advantage of the experience of our attorneys. Our attorneys will help take the confusion out of this complex process. Please save yourself the heartache and retain one of our professional attorneys to handle the process.